During a recent sea trial for Axiom™ Multifunction Displays with RealVision 3D™ Sonar, Raymarine’s UK-based test boat Raymariner came upon an interesting underwater target. 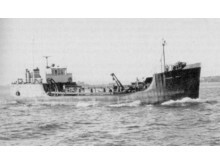 The M/V Margaret Smith was a coal dredger that capsized and sank near Yarmouth, UK in 1978. The wreck is part of the New Forest National Park and has become a popular feature for fishermen and scuba divers alike. Known to locals as “The Maggie”, the ship is now home to a wide array of different fish species. It’s also a great structure for testing and calibrating sonar equipment since it's a relatively young shipwreck that is well documented in both photo and video. Anglers everywhere know one of the best places to locate fish is around the bottom structure. The structure provides shelter and protection to smaller fish and attracts food that larger fish feed on. The structure can be natural objects like rocks, fallen trees, or underwater ledges. It can also be man-made objects that find their way into the water intentionally or unintentionally like shipwrecks and artificial reefs. 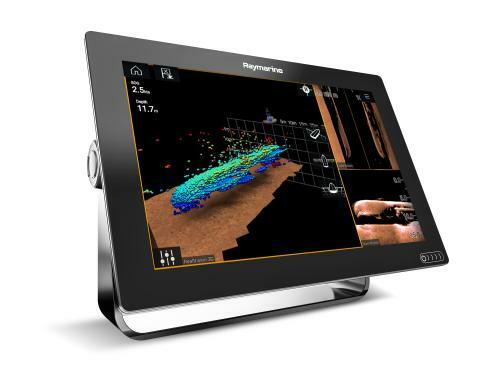 Raymarine’s Axiom RealVision 3D sonar system comes with an awesome array of tools for finding bottom structures and their fish inhabitants. 3-D sonar technology brings a whole host of benefits to anglers, divers and even cruising boaters too. With a simple swipe of your finger across the screen, you can pan and tilt the 3D image to visualise the underwater seascape from any angle. 3D imaging makes it simple to understand the size, depth and distances between objects. The RealVision 3D image is also gyro-stabilized. A sophisticated sensor in the RealVision 3D transducer measures the motion of the boat and automatically counteracts it to produce a stable and accurate sonar image. RealVision 3D also offers 2 different ways to visualise targets. The default setting is called Sphere Mode which uses round spheres of uniform size to represent individual returns. Sphere Mode helps make smaller targets (like bait and predators) look larger in the overall 3D presentation. This can be especially helpful when you’re looking for individual fish rather than large clusters, or if you are looking at the display from a distance. RealVision 3D can also render images in Point Mode. 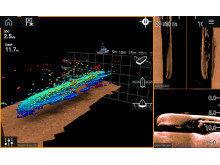 Point mode uses tiny pinpoints to show each sonar return in 3D space. While a lone contact will appear small in point mode, larger contacts and underwater structures will appear in very high resolution because the individual points will show the size and shape of these objects with extreme detail. In either point or sphere mode, you can also control how the colouring is applied to targets. When set to Depth mode, targets are coloured according to their depth in the water, using a rainbow scale (that cycles every 50-feet). In Intensity mode, targets are coloured according to the strength of their sonar return. Stronger returns are indicated by brighter colours. RealVision 3D also offers 5 different target colour palettes to choose from, along with options for background colour and bottom colour too. When hunting for bottom structure, Axiom’s RealVision 3D sonar gives you several other powerful tools too. 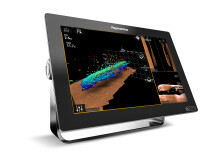 In addition to 3D sonar, Axiom also has high-resolution CHIRP DownVision and CHIRP SideVision sonar built in too. These options provide photo-like images of structures and fish and allow you to see even more detail. Axiom even has a Conical High CHIRP sonar channel that is optimised for finding fish. You can view these channels individually, or at the same time on your Axiom multifunction display. 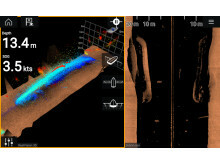 With Axiom, finding and visualising underwater structures and wrecks is easier than ever. 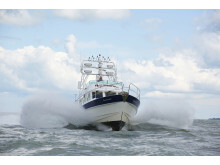 That’s something that fishermen, divers and even cruising boaters and explorers will truly enjoy! 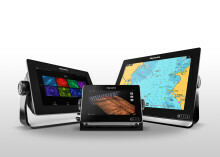 Raymarine launches quad-core touch-screen MFD with 3D viewing and real CHIRP functionality at the 2017 Miami International Boat Show We are pleased to announce an all-new family of Raymarine MFDs called Axiom, game-changers poised to shake up the marine electronics industry.